This update will have some noticable changes. Firstly, from now on the game will run in fullscreen. Now it will be rendered in 1920x1080 resolution and will fit the screen. Owners of bigger screens will have something to report. Secondly, the implementation of the game's rules is slowly following through. Every players cards are forming two rows - 2nd line and 1st line or behind line and front line. Corresponding changes are made in AI and network game. Thirdly, game's screen now has a painted background. What will be depicted there will still be decided, but it is the first version. I will remind what is there to do in the game – you can pick two armies that will combine into your deck with random cards. Then choose to play with AI, who will make moves in random fashion, or another person in internet. During the game the cards are put in the second line, then further to the 1st line. From the 1st line cards attack enemy's first line or headquarters (in the corner). Attacking cards loses 1 morale, but deals damage equal to its morale. Defending card gains additional toughness that is equal to its morale. Attack on the headquarter pushes the front line forward and when it reches zero the game ends. There was another force that took part in the events of 1919 and that had chosen an orthodox cross as its insignia. Although West Russian Volunteer Army officially was a Russian entity, predominant part of this force was German. Russian prisoners of war in Germany were allowed to organize into units for eventual fight against bolsheviks. These units were planned to merge with the parts of the former Western Army in Latvia, but they refused to comply. The basis of the conflict was the question: should this army receive German or Allied support? Instead of uniting, Russian units that leaned towards allies and were fighting bolsheviks until now under command of prince Lieven were transported north – to the Northwestern army. The units that had arrived from Germany in the summer of the year 1919 merged into West Russian Volunteer Army that was lead by colonel Bermondt-Avalov and stayed in Latvia. After Germans were officially ordered to evacuate to Germany they refused to comply too. Majority of German units that were located in western part of Latvia joined West Russian Army and formally were not part of German army anymore. While Allied politicians and generals tried to figure out what to do with the new situation, in october West Russian Army started an offensive against Latvian Army with the goal to capture the capital Rīga. After first success West Russian Army was stopped and in the beginning of november Latvian Army started counterattack and in one month's time drove West Russian Army and its German allies out of Latvia. West Russian army ended it's brief time of existance in German camps. There are several differences between unit types. Cavalry can move or attack twice, artillery can attack from the rear line, infantry hasn't changed. Movement back is possible - from 1st line to the 2nd line - if there is need to protect a unit from attack. Attacks at the enemy headquarters and 2nd line are allowed only if the 1st line is empty, except for own artillery in 2nd line that can bombard enemy's 2nd line. For a long time Comrades and Barons did lack quite improtant part - deck selection screen. The cards were put into the deck randomly (not less than a third from either army). However deck selection is an important thing and also a complicated thing - I would even compare its complexity to the game screen. Therefore this and several next updates will deal with the deck screen. 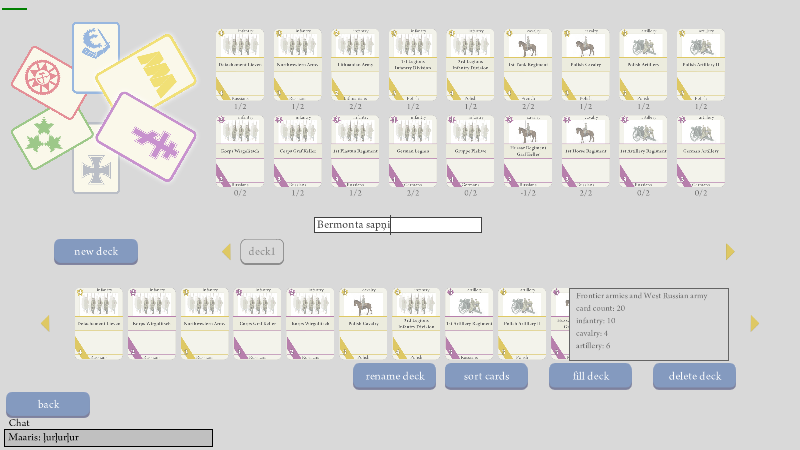 It is very simple this time - the screen has three zones: armies, army cards, deck. Clicking on card zone makes cards to appear in the deck; clicking on the cards in the deck removes them from the deck. Selected deck will be available in the game, even if it has only three or so cards. This update is a continuation of deck selection screen. There are several new actions available in pre-game screen. It is possible to create a new deck, that will be bound to selected armies. Cards from these armies are available to add to the deck. On the right side of the card list there is a window with some deck statistics, under it - buttons that allow to fill the deck automaticly with 20 cards, order them by price or delete deck completely. Deck selection now is divided between two screens. 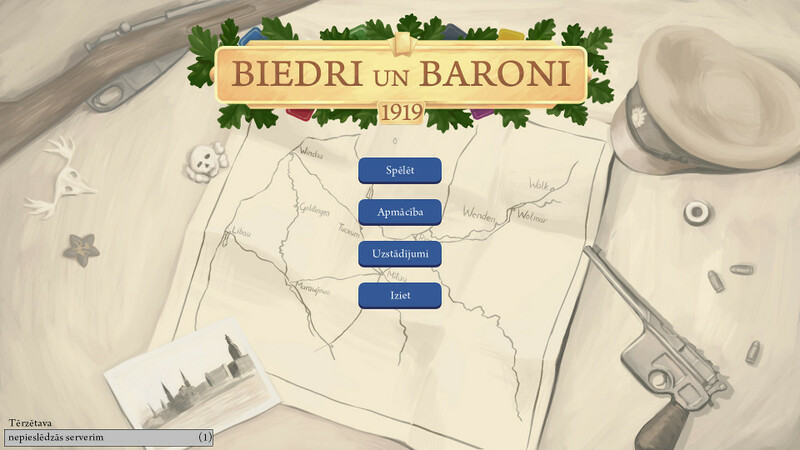 The first screen appears before the game and shows created decks, that can be selected to play in the game screen. From the deck selection screen branches off the card selection screen. 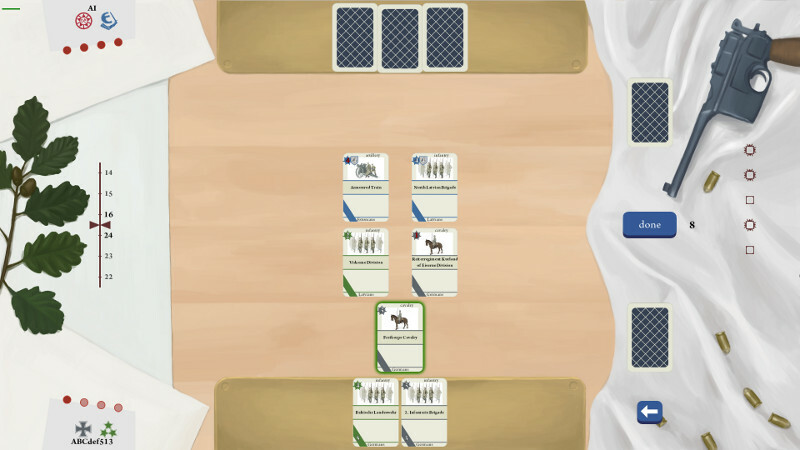 The army circle has returned in it and shows armies at the left of the corresponding cards. The topic of this update is user interface for card selection screen. All blocks that are bigger than their designated space on the screen now have mouse dynamics. Army selector moves around with acceleration and pushes card rows to their place accordingly. Temporarily card selection screen can be considered sufficently completed, it is time to move on to more important things. There are things that could be done - inspection of a single card, deck titles, better deck filling algorithm, error messages, sound effects etc. - but for now it is time to move to other parts of the game. The cards are finally rendered into GameMaker's surfaces and put on the screen scaled. Networking part is fully rewritten both on client and server sides. I think it was worth it, although in the end server side will be rewritten almost completely. This time lot of work was put into fixing and removal of various bugs and inaccuracies - there were many edits especially in timelines. Among them there is a year old bug in the card movement trjectory computation that somehow wasn't noticed all this time. A very useful job especially welcome if it results in a disappearance of long and useless code blocks. Sometimes your program is like vest with a loose thread. You pull this thread and the vest explodes because it belonged to some kind of terrorist. After some work the game has a new thing - text input. Deck names can be edited, player's name can be edited in option screen, and also there is a chat in the corner - quite primitive at the moment. There are some visible updates in the game screen. Card movement was getting cumbersome, therefore player is not moving cards themselves with a mouse anymore - now there is a movement marker. 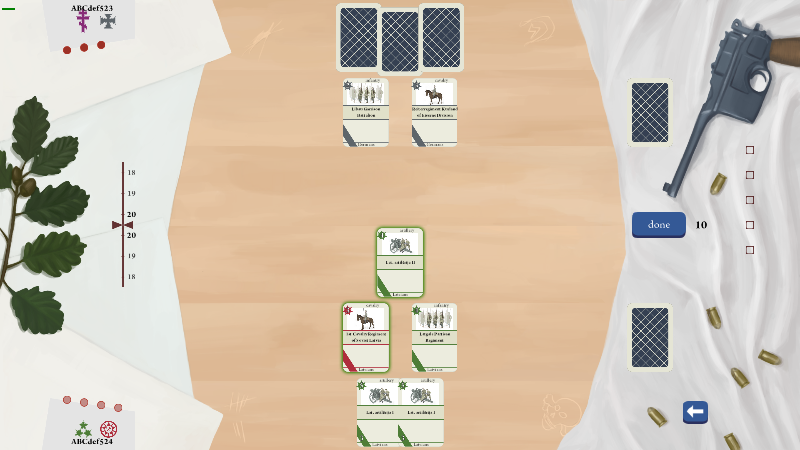 Green marker means that the card will use the mobility point (cavalry has two) and move to the pointed location, red marker - the card will attack, gray - mouse click will cancel the movement. Cards now look somewhat different, card images are replaced too. Also, cards in hand and on the game table now have different format. Parts of the cards and marker arrow are drawn with shaders. This update introduces action cards. They can be divided in two groups - aimed and general effect cards. Some unit cards also will have actions attached, i.e. damage enemy unit after entering play. Cards now have description with respective action information. For the time being this all works a bit clumsily; the action animations are lacking, card aura effects are missing, but the next step has been done. For visual part of the update - deck selection screen has been made clearer and better. Looks pretty cool! Will follow and keep an eye on this! I'm sure you're prioritizing game play over visuals but the board and cards look kind of bland and not particularly exciting so maybe down the line you could spruce it up a bit. Of course, the visual representation will change. Although I haven't updated this thread for some time, more changes will come soon - now in the next year. After a long pause development of Comrades and Barons continues. There are changes in rules - two battle lines are replaced with one front line. There are more and more diverse action cards and unit abilities. Just saw this. I love history and cant wait to play a part in it! The art does need to be updated but that doesn't take away from all the effort you've put into gameplay. Great job! Games AI is remade to actually resemble real player. It is not smart yet, but it is trying. Comrades and Barons have reached a peculiar state. Card game's mechanic and rules exists. There is a multiplayer mode, in which you can play with another player through internet. Ther is a single player mode, in which you can play against an artificial intelligence. Every part of the game is in place but none of them is finished. The development can continue, filling the features till every part is moved to rediness. Or it is possible to change the game simplifying it, so the project can finally be completed. The game will change. From now on Comrades and Barons will be a solitaire. That solves every problem. Solitaire doesn't need AI and a server. The whole game will be a historical single player mode. This thread will not be updated, updates will continue in another thread.